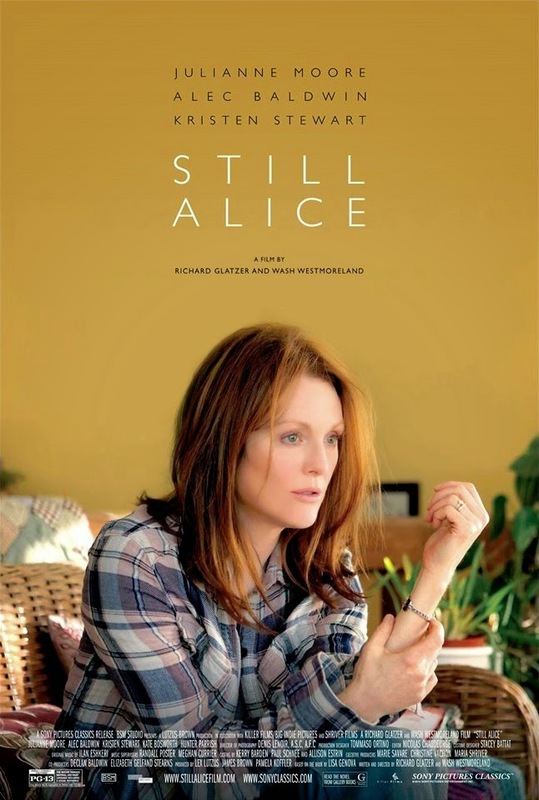 Clearly SONY has taken a very realistic approach to the poster for Still Alice. And with the solo shot of Julianne Moore looking both vague and vaguely frightened, it's clear the film is all about Alice. BUT Kristen Stewart fans - they are a hugely loyal and passionate bunch - take heart as word is the movie will get a qualifying OSCAR run here in Los Angeles in December with the intention of definitely putting Stewart up for a Best Supporting Actress nomination with Ms. Moore being promoted for a Best Actress nom. The film got the highest praise when it ran in Toronto, with both Moore and Stewart getting nothing but raves. The small clip we've seen doesn't give us too much to go on, surely we'll get a trailer soon? This is one of my most highly anticipated films, like many of the fans of Lisa Genova's book, I've got a personal connection to the destruction and havoc the disease causes. My mother lived with Alzheimer's for over 15 years after her initial diagnosis and seeing the unraveling of her mind was a slow, horrible and painful experience. I'll never stop wondering what it was like for her living within the nightmare. I can't imagine I won't be torn apart by the movie but we'll see.